Introducing the second generation Adms Speedline Driver, the Speedline 9032LS Driver. Designed with breakthrough aerodynamic technology for faster club head speed and more distance. The Drag Equation. To go fast you have to overcome it. Designed with advanced patent pending aerodynamic shaping, Adams Speedline Drivers create less drag and airflow turbulence resulting in 3-4 MPH higher club head speed. Take the Adams Speedline Challenge and compare your swing speed using the new Adams Speedline 9032LS Driver against all other drivers to experience the benefit of aerodynamics. • Patent pending aerodynamic design for 3-4 MPH more club head speed. • 10% lower spin than the original Speedline Driver for even greater distance. • Face area increased 17.3% deeper and longer. • Heel/toe scoops are 1.5x deeper, allowing air movement through the club head to be more stable. You HAVE to hit this driver to believe it! This club is SO good, I felt obligated to write a review. A pro referred me to it, after I gave him a list of the top driver brands that I was going to narrow down from. He told me this Speedline driver was the one I'd be going home with. I laughed, never hearing of this club. I have never hit a driver so far and straight consistantly. I'm 5'6" and a 12 handicap...not a power hitter. I am now hitting drives from 285-325. (measurements verified by the gps devices in the cart on several rounds) Make sure you swing this club before your next driver purchase. It is solid. I made a great buy! 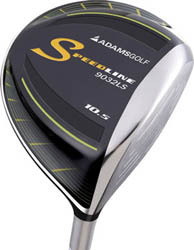 I really like my new Adams Speedline 9032LS driver. The head has a nice traditional shape and is very forgiving. Adams claims that the aerodynamic head helps increase clubhead speed, I'm not sure if is that or the Voodoo shaft, but it is longer than my old driver. Great Driver, I highly recommend it.